Maisons-Laffitte is a thriving, historic town located just 17km west of Paris. In combination with the other main Paris suburbs of Saint-Germain-en-Laye and Mesnil-le-Roi, there is a population 550,000, with a large number of English-speaking expats who commute into Paris daily. A variety of specialty boutiques and restaurants are available throughout town, with very quick access to Paris via the train or bus. Maisons-Laffitte is well-known for being the "birthplace of horseback riding" and for the national monument Château de Maisons, Louis XIV's hunting lodge. The world renowned Château de Versailles is also very close in proximity, enjoyed for its rich history, grandeur and rolling gardens. A welcoming suburb for families, with a large pedestrian park at its center, parents can feel safe having their children roam freely to visit friends or take their bikes into the Forest of Saint-Germain. A variety of team sports, activities and festivals are offered throughout the year and the weekly farmers' market is a must for locals. 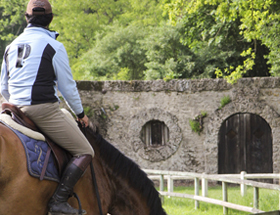 Whether living on campus or at home, Maisons-Laffitte offers students the opportunity to get involved, such as with riding lessons, theatre, tennis, rowing, swimming and more. The "City of Lights" is a magical place, where Parisians take time to enjoy long lunches and marvel at the romantic architecture. Located on the RER A line, the main rail network connects Maisons-Laffitte to Paris, taking approximately 20 minutes to arrive at the Champs Elysées. The SNCF train and RATP bus are also available. With Paris at our doorstep, students can apply their learning at some of the world's most renowned art and cultural museums. Whether visiting as a class, or just for fun on the weekends, students take advantage of one of the most cosmopolitan cities in the world.